1/ What is a Maxxum 9000 camera - in a nutshell? The Maxxum 9000 was Minolta's first professional autofocus 35mm SLR camera. It was released in 1985 as the top camera in Minolta's first line of autofocus SLR's (above the 5000 and 7000). It is often recommended for advanced amateur photographers who don't require a lot of automation, and for beginners who want a camera they will never outgrow. It is regarded as something of a classic camera - it has almost a cult following. 2/ What are its features? 3/ What is the 9000 like to work with? The 9000 was built as a no-nonsense tool for professional photographers. It certainly has a classical professional feel about it, with great ergonomics and solid construction. Most controls are easy to learn and situated where you need them, even if you have large hands. 4/ How is it built? The 9000 camera body, with batteries but without a lens weighs 645 g and measures 53 x 92 x 139 mm. When you attach the optional MD-90 motordrive the total weight is 1235 g, and the measurements are 53 x 152 x 139 mm. The main body chassis, mirror box and front plate are die-cast aluminium-alloy. The bottom cover is stamped brass. The lens mount is stainless steel and is securely attached to the aluminium chassis with 6 screws. The remaining cover panels are polycarbonate plastic. Inside, wires have been eliminated where possible by the use of over 50 gold plated pressure contacts at the edges of the circuit boards. The camera contains nine gold-plated switches. The film advance system is of hard steel, with ball bearings and bronze bushes, however the coupling between the wind gears and film drive sprocket is made of plastic. The shutter is a vertical-transverse focal plane type. The shutter blades are made of aluminium alloy, while the actuating arms are titanium. The 9000 has now been in hard work for over 10 years with few problems (see the section on buying a used 9000). 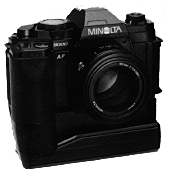 The Minolta Mailing List has numerous stories of 9000 cameras surviving incredible abuse. However, although the 9000 is one of Minolta's most rugged cameras, it is still just a camera, and it won't tolerate routine exposure to harsh bangs, moisture or dirt. 5/ I've just bought a 9000, how do I use the it's basic functions? The 9000's on/off switch is at the right hand side of the top panel. There are three positions, off, on, and audible. When the switch is set to the audible setting, the camera beeps when the focus is locked on the subject, and during self timer operation. The shutter-release button is situated at the front right of the top panel. Touching this button activates the meter, the LCD displays and the continuous autofocusing. In low ambient light, touching the shutter-release button also activates viewfinder illumination. After lifting your finger from the shutter-release button, the meter and LCD displays remain on for ten seconds. Pressing the shutter-release button half way down locks the focus, so the image can be recomposed. Pressing it all the way down releases the shutter. To open the camera back pull up on the rewind crank. At the same time slide the lock release (in front of the rewind crank) to the right. 6/ What is the 9000's autofocus like to use? The 9000 provides continuous autofocusing - ie. while your finger is touching the shutter-release button the autofocus continually tracks whatever is in the centre of the viewfinder, and the shutter can be released at any time. With the MD-90 motor-drive attached, you also have the option of focus-priority shutter release, where the shutter will not release until focus is locked on a subject. At any time autofocus can be disabled and the 9000 focused manually. To assist focusing, a green LED at the lower left of the viewfinder lights when the subject in the centre of the viewfinder is sharply in focus. If the subject is not in focus, two red LED arrows indicate which direction the focusing ring on the lens must be moved to bring the subject into focus. 7/ How does the 9000's autofocus compare to that of newer Maxxums? The 9000 represents Minolta's first generation of autofocus cameras - it has a single, horizontal autofocus sensor. In practice the 9000 autofocuses well in almost all situations and is very accurate. However it is more bothered by low light, low contrast or fast moving subjects than newer Maxxums. The 9000's autofocus is also slower than that of newer Maxxums, but for most users the speed is still quite tolerable. (For example, the 9000's autofocus speed may become a problem if you do mostly sports photography, but you will find it easily fast enough to follow your child playing with your dog). A good trick to greatly increase the 9000's autofocus speed is to use lenses which have small, light, rear focusing elements (for example the 28 to 135 f/4-4.5 zoom). The 9000 also lacks the predictive autofocusing of some newer Maxxums. 8/ Can the 9000 autofocus in low light? Not quite as well as later Maxxums. Minolta quotes the autofocus working sensitivity as EV 2 to 19 at ISO 100. A review of the 9000 at time of its release by Popular Photography magazine found the autofocus sensitivity to be EV 3 to EV 18. The same review found that the 9000's autofocus required 0.8 EV contrast in average light (EV 10 at ISO 100), and 2.4 EV contrast at the low light limit (EV 3 at ISO 100). Of course, the ability to autofocus in low light depends on the maximum aperture of your lens. For instance my 9000 autofocuses well at early dusk with the standard 50mm f/1.7 lens, but sometimes has problems in bright sunlight with a 500mm f/8 lens. The autofocus-illuminator unit (in AF flashes or as a separate accessory) projects a near-infa red wavelength pattern to allow the 9000 to focus in the dark. 9/ How does the 9000's autofocus work? Autofocus is by "through the lens phase detection". The following explanation is simplified from two articles which appeared in Popular Photography magazine in 1985. Light from the centre of the image passes through the semi-transparent main mirror, and strikes a piggy-back mirror. Light is reflected from a small polished area in the centre of the piggyback mirror to the focus-detection module. Here lenses split the image into two beams (left and right), both of which strike a horizontal array of charge-coupled devices. When the image is in focus on the film, the two beams will each strike a pre-determined position on the array of charged coupled devices. If the image is shifted out of focus, the two beams will move across the array of charged coupled devices in opposite directions. Electrical signals from the charged coupled devices are used to direct the autofocus motor, and to light the appropriate focus symbols in the viewfinder. 10/ What are the 9000's metering modes? The 9000 has 4 metering modes, selected by turning a dial on the rewind crank. The metered exposure settings can be locked by maintaining pressure on the autoexposure lock key, situated under your thumb on the back panel of the camera. The metering indicator in the viewfinder blinks if the ambient light level is outside the meter's range of accuracy. Centre-weighted average metering With centre-weighted average metering the sensitivity is EV 1-20 with ISO 100 film and a 50mm f/1.4 lens. Spot metering for mid-tones Meters a 5.5mm diameter circle (2.7% of the film frame) in the centre of the viewfinder. This metering mode is designed to correctly exposure a mid-grey tone (the traditional photographer's 18% grey card). Spot metering for highlights Meters the same 5.5mm diameter circle as mid-tone spot-metering, then introduces a 2 1/4 stop overexposure. This metering mode is designed to correctly expose the light-toned highlights of the image, which would appear too dark (underexposed) if a mid-tone reading were used. Spot metering for shadows Meters the same 5.5mm diameter circle as mid-tone spot-metering, then introduces a 2 3/4 stop underexposure. This metering mode is designed to correctly exposure dark-toned shadows in the image, which would appear too light (overexposed) if a mid-tone reading were used. 11/ How does the metering work? Light from the image passes through the lens and the semi-transparent main mirror, and strikes a piggy-back mirror (the centre of which is also used to reflect light to the focus-detection module). A grooved frosted surface which covers most of the piggyback mirror reflects light from the image to a compound silicon photocell. The central portion of the photocell is used for spot metering, while the entire photocell is used for centre-weighted average metering. The photocell also receives light from a small aspheric plastic lens. This collects light from the film plane to allow metering of flash exposures. 12/ What are the 9000's exposure modes? The 9000 has 4 exposure modes, which are selected by turning the large ring which surrounds the LCD display on the top panel. In any mode, up to +/- 4 stops of exposure compensation can be set by moving the shutter up/down control while pressing the exposure adjustment (+/-) key. Metered manual (M mode) Choice of full and half stop aperture settings, using the aperture up/down control. Choice of full stop shutter settings from 30 seconds to 1/4000 second and bulb using the shutter up/down control. The viewfinder indicates the chosen f-stop and shutter speed, and the exposure error (up to +/- 6 stops), according to the camera's spot or centre-weighted averaging meter. When bulb setting is used, the maximum exposure time depends on battery capacity. The 9000 manual suggest it is about 8 hours with fresh Alkaline-Magnesium batteries. Aperture-priority auto-exposure (A mode); Choice of full and half stop aperture settings. The shutter speed display blinks when the shutter speed required for correct exposure is out of range. Shutter-speed priority auto-exposure (S mode) Choice of full stop shutter speed settings. The aperture display blinks when the aperture required for correct exposure is out of range. Programmed autoexposure (P mode) This mode allows you to use the 9000 as a point-and-shoot camera. Programmed auto-exposure choses the combination of aperture and shutter speed which provide correct exposure, and are best suited to the focal length of the lens. One of 3 programs (tele, medium and wide) is automatically selected. For instance a small aperture is chosen to maximise depth of field with wide angle lenses, and a fast shutter speed is chosen to avoid camera shake with telephoto lenses. You can program your own exposure curves with the Program back Super-90. The program changes from wide to standard at focal length of 35mm, and from standard to tele at 105mm. (You can see the shutter speed and aperture change as you alter the focal length of a zoom lens). The combination of aperture and shutter speed dictated by the program can be adjusted while maintaining the same overall exposure by using the shutter or aperture up/down control. However this "program shift" adjustment has no memory, and your adjustments vanish 10 seconds after you remove your finger from the shutter release button. 13/ What happens when you press the shutter-release? The following explanation is simplified from articles which appeared in Popular Photography magazine in 1985. Everything that occurs after the shutter is released is spring-driven. When the shutter release button is pressed, electromagnets release the main mirror and the diaphragm actuator. As the diaphragm actuator moves, it turns a chopper wheel which spins within an infa-red motion-detection module. Information from this module is used to count the number of fractions of an f-stop the diaphragm actuator has moved. When the required f-stop has been reached, an electromagnet drops a latch onto a ratchet wheel to halt the diaphragm motion. Meanwhile the main mirror has been swinging upward. When the main mirror has reached the top of its swing, it releases a mechanical latch on the shutter's opening blade set. The opening blade set crosses the film in approximately 1/300 second. An electronic timer then determines when an electromagnet releases the shutter's closing blade set to finish the exposure. The mirror and diaphragm are then returned to their focusing positions. The time lag between pressing the shutter release and the beginning of the exposure is 80 to 160 milliseconds (average for contemporary cameras). Apparently part of this time lag is intentionally introduced by a time delay circuit, to allow the exposure metering circuitry long enough to produce a stable reading of the scene. The vibration and noise produced during shutter release are above average for contemporary cameras. 14/ How do I use the depth of field preview? The electronic depth of field preview button on the front right of the camera operates in all exposure modes. The preview switch is situated below the shutter release button, and folds away when not in use. Pressing it half way down and releasing it stops the diaphragm down to the taking aperture and locks it. In addition a "F" blinks in the viewfinder, and the autofocus is locked. The depth of field preview is cancelled by releasing the shutter, or pressing the preview switch all the way down and releasing it. The preview switch will not operate if the film has not been advanced. The depth of field preview is quieter on the 9000 than on later Maxxums. In addition the depth of field preview on the 9000 is lockable, while on later Maxxums depth of field preview only operates while you continue to press the depth of field preview button. 15/ Does the 9000 allow multiple exposures? You can take as many exposures as you wish on the one frame, by holding in a small button beside the autoexposure lock key each time you wind the film. 16/ Is there a provision for near- or far-sighted users? The eyepiece adjustment dial allows the from -3 to +1 dioptres adjustment of the eyepiece lens. For further adjustment eyepiece correction lenses were available which snap onto the eyepiece frame. The viewing area is approximately 94% of the film frame. 17/ What does the MD-90 motor drive do? The MD-90 motor drive slots onto the base of the 9000, and provides 2, 3, 4, or 5 frames per second firing, in addition to single frame advance. When using the MD-90 motor-drive for sequential firing, autofocusing ends with the first shot in the series. With the MD-90 motor-drive, the shutter mechanism is fast enough to allow 5 frames per second film advance only if the shutter speed is 1/125 second or faster. The MD-90 rewinds a 36 exposure film in just under 7 seconds, leaving about 75mm of leader sticking out of the film cartridge. The MD-90 also provides a vertical format shutter-release button on its bottom right hand corner. As an option for left-handers, an MD-90 with the vertical shutter-release button on the lower left corner was also available. The MD-90 came with either an AA-size battery pack (BP90), or with a rechargeable Ni-Cad battery pack (NP-90). The BP-90 is good for bushwalking / safari's when you do not have access to mains electricity for charging the NP-90. The NP-90 is reputed to allow slightly faster winding than the BP-90. For an idea of the overall size of the 9000 with MD-90 and NP-90, see the photo of the Maxxum 9000 mounted on an MD-90 above. To detach the battery packs from the MD-90 motor, look for a sliding lever at the right of your battery pack where it joins the motor. Slide this lever and pull the right side of the battery pack down and to the left away from the motor. There is also a winder available for the 9000, the AW-90. This is substantialy lighter than the MD-90 (about the size of the MD-90 without its battery pack). It has a maximum speed of 2 frames per second. It has no motor-driven rewind or vertical shutter release button. It is powered by 4 AA batteries. 18/ What do the optional program backs do? The Program Back-90 provides 3 formats of date/time recording, recording of numerals along the edge of the frame, and an intervalometer. and an 8-reading spot meter memory. The Program Back Super-90 is rather complex to operate - you may need to have the manual with you for your first few rolls of film with this accessory. The liquid crystal displays of second hand backs are often badly faded. The Program Back Super-90 makes it difficult to wear glasses while shooting. 19/ What focusing screens are there? Type G - the standard screen - a matte field containing the focus frame and spot metering circle. Type PM - originally made for the 7000 body - Similar to type G but with a split image microprism. 20/ What batteries does the Maxxum 9000 use? Two AA batteries fit into a removable compartment inside the right hand side of the body. Either Alkaline-Magnesium, Nickel-Cadmuim or Carbon-Zinc batteries can be used. Even when the camera is switched off it draws a small amount of current (about 0.01mA). The LCD's on the 9000's top panel blink when battery power is getting low. The 9000 will not operate without batteries. Exposure adjustment settings, film speed, and manual exposure settings are stored in the 9000's memory when the camera is switched off. 21/ What flash functions does the 9000 provide? Several flash units can be mounted on the accessory-shoe above the viewfinder, on the control grip (CG-100) accessory, or on a remote cable. A PC-type sync terminal is also provided for flash units that do not fit in the 9000's accessory-shoe. Four flashes are dedicated to the 9000 body; 1800AF, 2800AF, 4000AF and the 1200AF ringflash. All provide direct flash metering (through the lens off the film) and automatic fill flash. The 1200AF is a ringflash (surrounds the lens) which provides shadow-free lighting for macro photography. It has 4 focus lights and 4 individually selectable flash tubes. The 1800AF is a budget flash at the bottom of the range. It provides TTL metering and autofocus illumination, but lacks features found on the 2800AF and 4000AF such as a test button or an accessory connector plug. It has only one power setting. The 2800AF is next up in the range. It has 2 output settings, and has a flash coverage equivalent to a 35mm lens. The 4000AF is the top of the range of flashes dedicated to the Maxxum 9000. It has 6 output settings, and the flash head zooms to provide automatic adjustment of flash coverage for lenses from 28 to 70mm. The head of the 4000AF can be tilted / swivelled, and when set at its lowest power setting the 4000AF's recycling interval is short enough to allow the MD-90 motor-drive to be used at 2 fps. Minolta quotes the ISO 100 guide numbers as; 18 meters for the 1800AF, 28 meters for the 2800AF, and 40 metres for the 4000AF. The 1800AF, 2800AF and 4000AF incorporate an autofocus illuminator, which is activated when the ambient light level falls below about EV 2. The autofocus illuminator projects a pattern of near-infa red (but still visible) light onto the subject to allow autofocusing. The operating range is between 1 and 5 meters, and it seems to work best with lenses faster than about f/4.5. In P mode the X-sync shutter speed selected depends on the light level (1/250 above EV 13 at ISO 100, 1/125 EV 12 - 13, and 1/60 below EV 12). Fill flash exposure is automatic, and usually produces very natural-looking results. In S mode the aperture is automatically set to f/5.6, and any shutter speed 1/250 second or slower can be selected. This allows control over the balance of flash and ambient light. However, if your want a little more automation, the 9000 provides a neat way to automatically expose the ambient-lit background as much as is possible without overexposing your flash-lit subject. To use this automatic "slow shutter sync" mode, press the auto-exposure lock key as you release the shutter. This will correctly expose your main subject (which will be lit by a combination of flash and ambient light), while effectively underexposing the background (lit by ambient light alone) by 1 stop. One use of this function is to produce deep blue skies behind a correctly exposed flash-lit subject. (Note that there is one limitation - you should ensure that the shutter speed required to correctly expose the background (with the flash turned off) is equal to or slower than 1/125 second). In A mode X-sync shutter speed is set at 1/250 second, and any aperture can be selected. For instance you may select a wide aperture for maximum flash distance or fast recycling time, or a small aperture for greater depth of field. To use slow shutter sync or fill flash, select the appropriate aperture, and press the auto-exposure lock key as you release the shutter (as described for S mode). In M mode any shutter speed from 30 seconds to 1/250 second can be selected, and any aperture can be selected. Note that the 9000's exposure compensation function alters the total (flash + ambient light) exposure - it does not alter the balance between flash and ambient light exposure. Duncan James has a method of adjusting flash exposure independent of ambient light exposure. "Use the camera in Manual and meter as usual. Then, use the ISO setting as you would on a camera without exposure compensation - increase the film speed setting to reduce exposure, or lower the setting to increase it. All this assumes that you don't change the aperture/shutter speed settings. The camera uses the ISO setting to determine all aspects exposure including flash, so if all other settings stay the same, only the flash power varies. Manual is the most convenient mode for this. In theory, it would be possible to do the same thing in other modes by using the AEL button, but it would involve so much simultaneous button pressing that you'd virtually have to be a concert pianist to do it". In manual mode you can of course also alter the flash ratio by altering the power setting on the flash, with reference to the coverage distance displayed on the flash LCD panel. 22/ What flash accessories are there? The Control Grip-1000 (CG-1000) is an L-shaped bracket which attaches to the bottom of the 9000. It connects electronically with contacts on the base of the camera, and provides an off-the-camera accessory shoe for the flash. It contains 6 AA batteries to reduce flash recycling time (especially useful when the motor-drive is used). If two flashes are used (one in the CG-100 and one on the camera hot shoe), 2/3 of the flash illumination is supplied by the off-camera flash. The CG-1000 comes with a separate autofocus-illuminator unit which fits into the camera's accessory shoe, and a 5m flash extension cord. The OC-100 is a cable about 1 1/2 meters long, which fits into the 9000's accessory shoe, and plugs into the flash body. It allows the flash to be used off the camera - everything functions except the autofocus illuminator. The OC-100, along with an aluminium L-shaped flash bracket is a much cheaper alternative to the CG-1000. See a photo of this set-up above. For using multiple flashes off the camera several cables and a Triple connector were available. A Bounce reflector set, Colour panel filter set, and an AC (mains) power adaptor were available for the 4000AF. 23/ What other flashes work with the 9000? The PX series all work with the 9000 to provide TTL flash metering, but provide no autofocus assistance. The X series will operate with the 9000 without TTL metering. Most later flash units designed for Maxxum cameras will operate in TTL mode with the 9000, but the FS-1200 adaptor is required to connect these units to the 9000's accessory-shoe, and some functions are lost. For instance the 5400HS flash used on a 9000 with the adaptor loses high speed sync, power zoom, viewfinder indication of a good exposure and AF illuminator. 24/ What other accessories were made for the 9000? A winder (the AW-90) was made for the 9000. It was lighter than the MD-90 motor drive, and gave a maximum speed of 2.5 fps. Like the MD-90 motor drive, the AW-90 winder allows switching between focus-priority and continuos autofocusing. IR-1N - a wireless controller set, which can control the camera from up to 60 meters away. A hand-held transmitter contains of a small electronic flash-tube covered by an infa-red filter. A near- infa-red receiver is connected to a Maxxum's remote shutter release terminal by a short cord. The transmitter / receiver can operate on 3 channels to avoid interference with other units, or to control 3 cameras with the one transmitter. Note that this system provides shutter release only, there is no mechanism to activate the autofocus. RC-1000L and RC-1000S - 5metre long and 50cm long remote release cables which activate both autofocus and metering. Angle finder Vn and Eyepiece Magnifier Vn. A 100 exposure back (named the EB-90) was made for the 9000. It included a built-in Program back Super-90. I've never seen one, but they are advertised by second-hand mail-order companies every now and again. A fibre-optic polaroid back for the 9000 (named the "ProBack") was manufactured by Forscher. It was expensive, and like all 35mm polaroid camera backs it can only be used after the film and standard back have been removed from the camera body. A cheaper option is to use Polaroid's instant 35mm films ("Polapan"). The DR-1000 data receiver allowed unattended flash metering when used with the Minolta flash meters III and IV. This device consists of a transmitter unit which attaches to the flash meter, and a receiver which mounts on the 9000's accessory shoe. Readings from the flash meter are transmitted to the camera by infa-red pulses. Apparently this device could also be used with Minolta incident light meters. I think these are rare - I have only ever been told of one DR-1000 set being advertised second hand. 25/ What do I look for when buying a used 9000? A used 9000 body should not cost much more than US$300 / Australian$600. (US$450 with an MD-90 motor drive). When new in 1985 the list price for the body was US$670 / Australian$1250. Shutter-release and lens stop-down electromagnets can malfunction - check that the shutter is correctly timed and that the lens stops down when the shutter-release button is pressed. Also check the lens stops down when the depth of field preview is activated. Loose / bent diaphragm stop-down levers (select the smallest available aperture, and check the lens actually does stop all the way when the shutter is released). Check all body screws for burring - indicates that an amateur has had the body to pieces! Check all seals around the film compartment and the mirror housing - like most cameras they eventually turn to "goo". Take some test photos with the camera before buying! 26/ I'm thinking of buying a 9000 but also looking at other cameras - Does the 9000 have any disadvantages I should know about? First generation autofocusing - The 9000 has only a single horizontal autofocus sensor. No matrix metering - however the 9000's centre-weighted average metering is quite adequate for most situations. No memory. After about 10 seconds the camera discards program-shift settings, and when you take your finger off the exposure-lock key the camera discards your carefully chosen spot meter reading (unless you have the Program Back Super-90). Repair parts may become scarcer / more expensive in the future as apparently Minolta is in 1997 sending the last supplies of 9000 body parts to repairers. (However this is probably not as bad as it sounds - there are still a lot of parts out there, which will take many years to get used up). The 9000 will not function properly with xi or power-zoom lenses (however there is almost always an equivalent non-xi / manual-zoom lens available. In addition, the xi lenses rapidly drain batteries, and participants of the Minolta Mailing List have claimed that some xi lenses are optically inferior to their manual zoom counterparts). The 9000 does not take function cards (however the sort of photographer who choses a 9000 probably won't need/want the automation which function cards provide). The 9000's flash autoexposure system, while exceptionally accurate, isn't as advanced as the flash system of the newer xi / si Maxxums. No mirror lock-up. (None of the Maxxum's have this - Minolta claims that today's low-vibration shutter mechanisms make a mirror lock-up feature unnecessary). Apparently the 9000' s polycarbonate plastic cover panels are not as scratch-resistant as the newer 9xi's UV-hardened polymer coating. The 9000's technology is 7 years older than the 9xi's technology. 27/ What are the other models in the Maxxum x000 series like? Please take the time to send in corrections or new information. I want the details of this FAQ to be rock solid. This FAQ will be updated every 6 months or so. The author wishes to acknowledge the help of all 9000 users on the Minolta Mailing List, especially those who often discuss Maxxum 9000 issues. Thanks to Duncan James for corrections and helpful advice. Thanks to Craig Huxely for having this FAQ on his Minolta Users' Group web site. A very good site for all things Minolta. Thanks to Magnus Gustafasen for having this FAQ on his Maxxum-9000 home page. This document will be copyright 1997 by Cris Print. You may copy and distribute this FAQ without charge, provided it is reproduced in its entirety, and provided it is not used for direct commercial advantage. The author has endeavoured to ensure all information in this FAQ is accurate. However, the author does not assume any responsibility for losses and damages resulting from the use of the information in this FAQ. You use the information in this FAQ at your own risk.